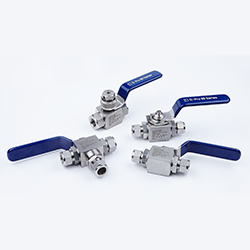 DK-LOK® V86/VC86 Series Ball Valves provide leak tight performance with a variety of end connections up to pressures as high as 10,000 PSI. The V86/VC86 series incorporates a blowout proof design, a handle indicating flow direction, positive stop with a robust stop pin, high flow rate with maximum orifice sizes, various flow control configurations with side and bottom inlet port on 3-way diverter valves, seat material options, locking capability and panel mountable for your system needs. The VC86 series is specific for CNG applications incorporating live loaded seats and HNBR elastomers for meeting compatibility and temperature requirements. Every valve is tested with nitrogen gas @1,000 psig (68 bar) for leakage at the seat to a maximum allowable leak rate of 0.1 SCCM. The stem packing is tested with nitrogen gas @1,000 psig for no detectable leakage.